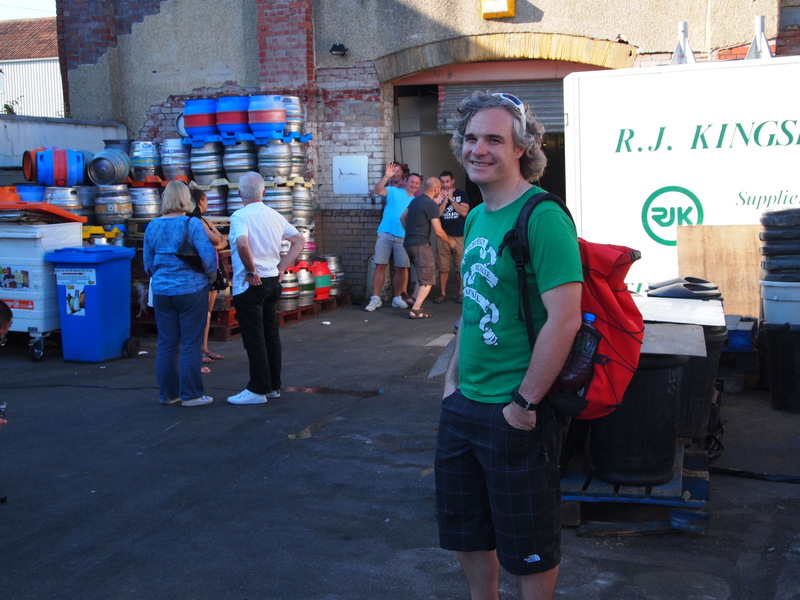 Earlier this week I was lucky enough to have the opportunity to look around the Bristol Beer Factory. Always glad of the excuse for a trip to Bristol, particularly in glorious sunshine, we set out early in the day so we could have a little wander before the tour. After we had checked in to our hotel, the first stop was the Bristol Beer Factory’s Grain Barge where we had hoped to get some lunch. Unfortunately, they had stopped serving food by the time we got there! Since it was such a gorgeous day we still stopped for a little drink; I enjoyed one of my favorite beers, the Milk Stout and the OH went for a refreshing Southville Hop. 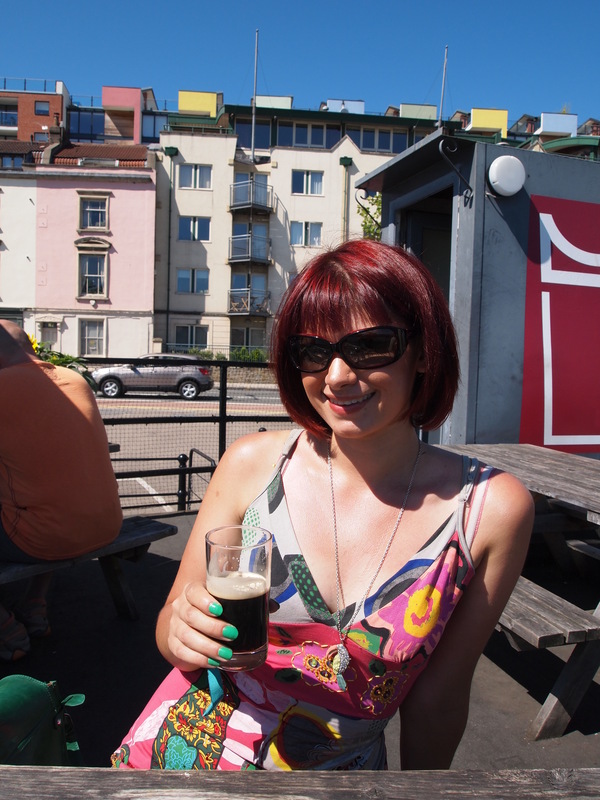 There aren’t many better places to soak up the sun in Bristol than the Grain Barge with beautiful views (you can see the SS Great Britain) and good beer. What more could you want! We still needed to eat though, and against the better advice of the Twitter hive-mind we ended up at the intimidatingly huge hyper-buffet, Zaza Bazaar. Although not exceptional, I have never seen so much variety at a buffet and it was not nearly as bad as the average all-you-can eat. There is always a danger of not knowing when to stop when presented with so much food so it’s maybe a good thing that there’s an hour time limit! I’m sure we worked some of it off with a brisk walk uphill to Corks of Cotham where we stocked up on a few beers to take home. Then, by the time we got our spoils back to the hotel it was time to set out on another brisk walk to the factory of beer! Waiting for the tour to start! Having just started home-brewing, I was very excited to see how it’s done on a larger scale. The only other tour I have been on was York Brewery which was many years ago. Having hurried over, convinced we were running late, we were actually amongst the first to arrive, which gave me time to survey the many empty casks outside, seeing how many of my favorite breweries I could spot. I was also discretely observing the gathering crowds, trying to guess which one could be the writer of the Beer For The Weekend blog without looking like a weirdo. Thank goodness he introduced himself! Walking in to the brewery, I was pleased to note that it smelled pretty similar to the cupboard where my homebrew sits so I must be doing OK. We were met and shown into the brewery by Simon Bartlett, the Managing Director, who issued us with our very own Bristol Beer Factory branded pint glasses and invited to help ourselves to West Coast Red, Southville Hop and the rather exciting brand new collaboration with Dark Star, Southern Conspiracy (6.3%ABV)! Having followed the brew day on Twitter which was happening the same weekend as Grillstock, I was keen to try it and it was well worth the wait. If you love beers made with the tropical, mango and pineapple hops from New Zealand, this is amongst the best and you really must track it down. Although I had a drop of the other two beers on offer, I kept coming back for more of that sunshine stuff which, at 6.3%, made for a merry evening.Somewhere in the brewery there’s a couple of white wine casks with Southern Conspiracy ageing on fresh gooseberries which may just take it to the next level. Since the Beer Factory’s bottles can be found at so many retailers now, I was surprised at how small the brewery was and even more impressed considering how much high quality ales come out of there. The talk by Simon was pretty informative; he started by telling us about the brewing process, their equipment and the ingedients they used and passed around glasses containing hops and malts for us to smell and taste. It was fascinating to learn about the history of the Old Brewery which, many years ago, was home to the Ashton Gate Brewery. 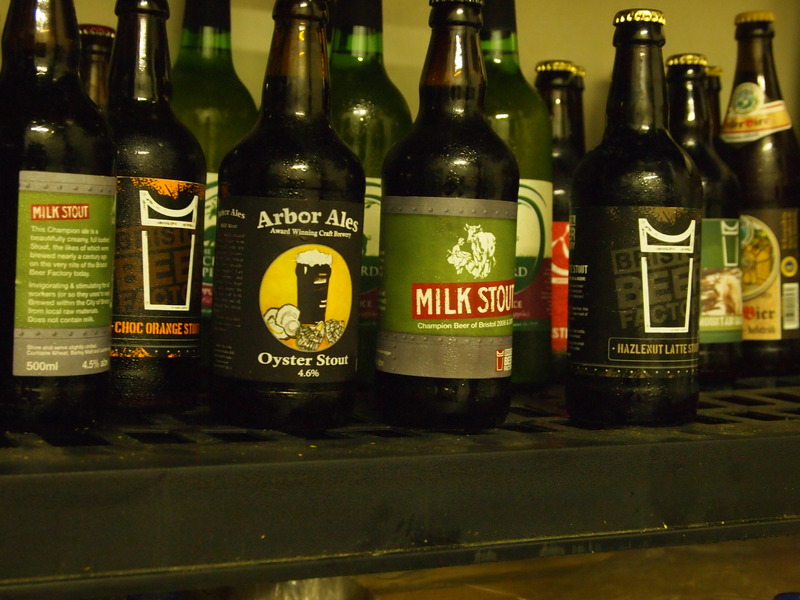 Ashton was most famous for it’s MIlk Stout which was the inspiration for the Beer Factory’s ale which is so popular today. Since Ashton Gate was bought by Georges’ and closed down in the early 30s, it went through a variety of changes of use until it was bought by local architect George Ferguson and restored to it’s former use. Simon also gave us the opportunity to ask any questions we wanted to. Mmmmm…could this be the last bottle of Chocolate Orange…? After the talk and Q&As, we were allowed to have a little look round and it was great to mingle with fellow beer-lovers. 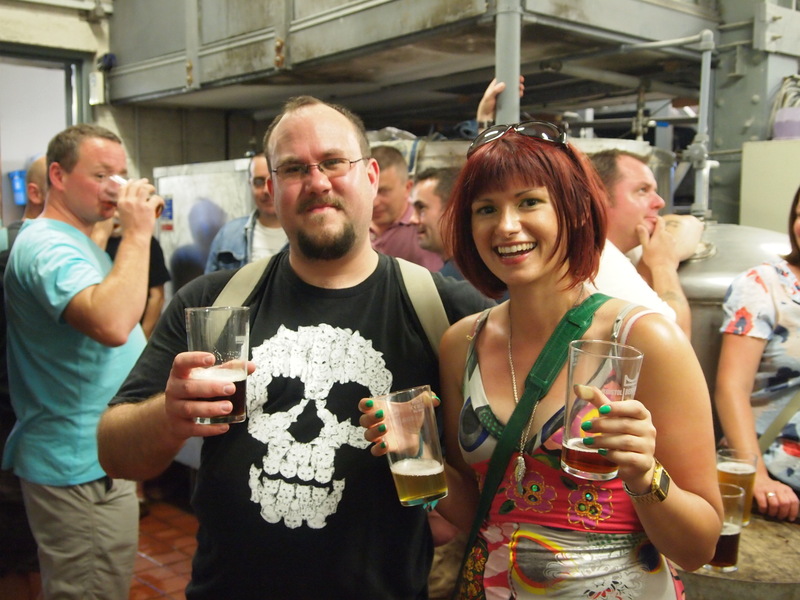 Rather than the stereotypical beerdy old men, the crowd was a good mix of young and old, men and women which really demonstrates the wide-reaching appeal this brewery has. It was great to be able to have a chat with Simon about all the amazing stuff they have planned, including the next 12 Stouts of Christmas, but I have been sworn to secrecy on any more detail than that. I think everyone had a pretty good time and it ended up like a pretty beery social gathering. It was pretty well-pitched for seasoned beer-drinkers and newcomers alike and everyone went away with a lovely bottle to enjoy at home. A great evening! Just hope I wasn’t too tipsy by the end! Great brewery – with consistently good beer.